Teachers vowing to "hold firm". Bratislava, January 25 (TASR) – Teachers who’ve come to Bratislava to express their discontent on Monday expect the Government to do its utmost to see the strike that began on Monday to end post-haste, TASR learnt on Monday. „They (the Government) should think through as to what they’ll do next. We’re ready to negotiate,“ Branislav Kocan of the Slovak Teachers‘ Initiative (ISU) said on Monday. He added that teachers are ready to hold firm „until the end“. 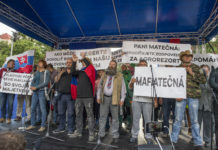 Around 2,000 teachers – endorsed also in person by the representatives of trade unions representing doctors and nurses – gathered on Bratislava’s SNP Square on Monday morning to express their demands. The crowd, also including teachers from as far away as Kosice, Zilina, Banska Bystrica as well as Nitra and Trnava, then went on to the gates of Parliament. The rally concluded at around 1.15 p.m.
Holding banners reading ‚Gathering of Empty Pockets‘ or ‚Dignity for Teachers‘ Profession‘, ringing bells and whistling, teachers reiterated their demands – an across-the-board salary increase for all teachers and other professional employees in regional education by €140 as of 2016 and by an additional €90 as of 2017. Among other demands, they also urged an extra €400 million for the budgets of the Education, Science, Research and Sport Ministry and Interior Ministry in 2016 with a view to removing the disparities in the quality of equipment and facilities at individual schools. „I didn’t expect this many colleagues to show up. We filled the entire square … roads. I believe the whole society must’ve taken notice of something going on here and of teachers making it clear that they want change at last, not promises. And we want the change now,“ said fellow organiser Vladimir Crmoman. Another demonstration is scheduled to take place in Levice (Nitra region) this Wednesday. The disgruntled teachers also seek to meet parents and the public in general so as to explain their further steps to them. 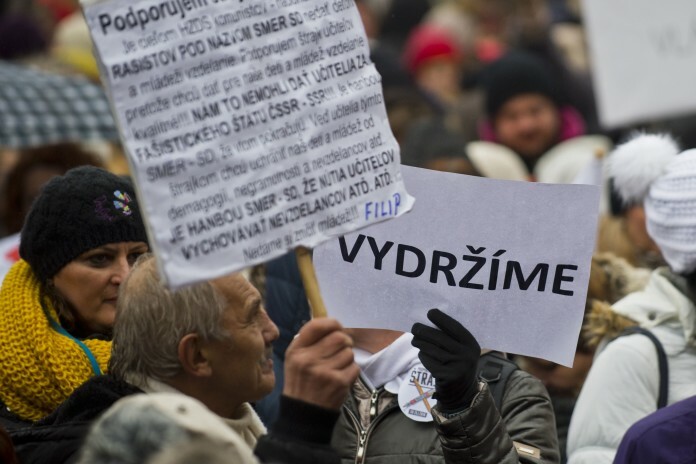 Over 11,600 teachers – of 89,000 in Slovakia – joined the strike as of 2 p.m. According to the Education Ministry’s statistics, there are 2,935 pre-schools, 2,113 primary schools and 868 secondary schools; and 301 schools remained shut across Slovakia on Monday due to the strike.